Their gracious bar hosts, Lynette Schultz and Dominic poured their favorite wines into glasses, going off the normal tasting chart. Lynette, who is the new manager for 2Plank Vineyards even has a talent for guessing what your favorite kind of wine is and mysteriously has that bottle in hand ready to pour. As the Angels painted, Dominic walked through the room taking orders, to the delight of the group. And they thought the sipping was over. 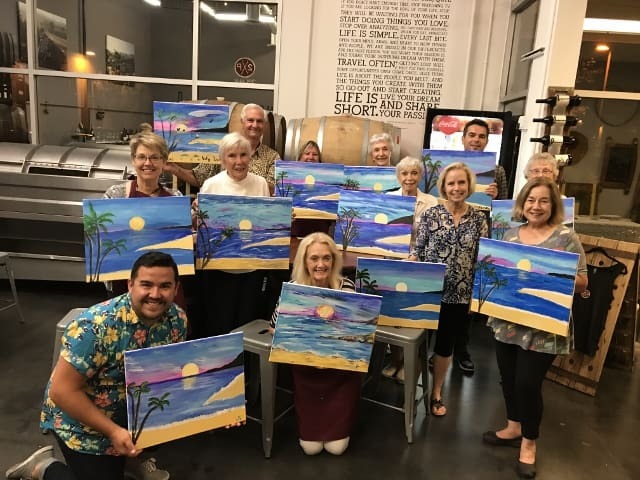 Janet Dunn was once again, the art instructor. Her talent for teaching “us rookies” is amazing and said her younger students are much more critical than us older students. Her helper this year was Barbara Meech who walked around the room handing out extra paper towels, freshening water, throwing out helpful painting suggestions and squirting more paint on to our color palettes. A poster on the wall had a saying: “Life is about the people you meet and the things you create with them. 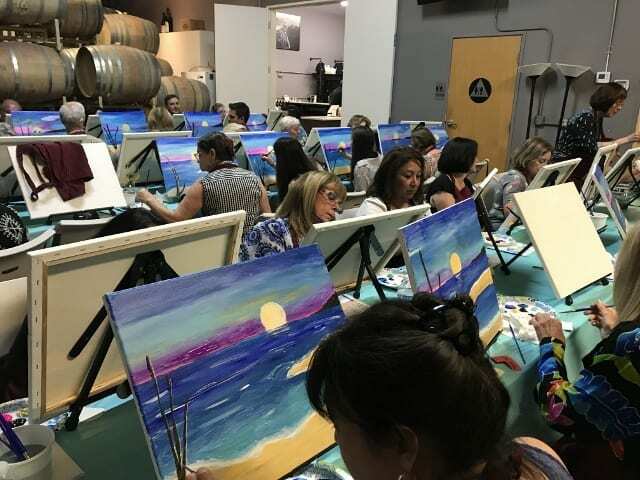 So go out and start creating!” How’s that not make Friday the 13th a very lucky evening for all of us who gathered for Wine Sips & Brush Strokes. Founded in 1992, the Auxiliary’s mission is to promote and assist the fundraising efforts of Moonlight Cultural Foundation. Join the Auxiliary to network within our community and make great friendships that will last a lifetime. We offer our Auxiliary members various volunteer opportunities, special events, and fundraising activities. Come, get involved in the rich cultural heritage of Vista! We welcome your friends and family… the more the merrier!